When dogs eat their food too quickly, they inevitably ingest a lot of air while eating. When this happens, it can cause general stomach upset, vomiting and even choking. When dogs ingest a lot of air it can also increase the chance that your dog will suffer from a very serious issue, gastric dilatation-volvulus (GDV), or more commonly known as bloat. Here is a description from the AKC website about what is happening when bloat occurs. An affected dog will feel pain and might whine if you press on his belly. There are many factors that can contribute to bloat, including eating too fast. Dogs that eat too fast are five times more likely to suffer from bloat. To slow your dogs down, we LOVE this Fun Feeder Slo-Bowl! We are also giving this bowl bonus points because it is top rack dishwasher safe! While eating too quickly certainly does not always lead to bloat, ingesting a lot of air can still cause stomach discomfort and lead to very unpleasant side effects if you know what I mean. 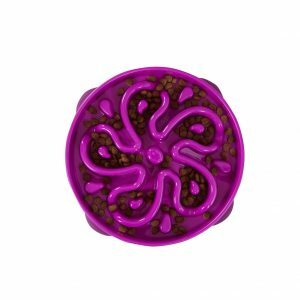 Help slow your dog’s eating down with this great bowl! Click here to order one for you best friend today!